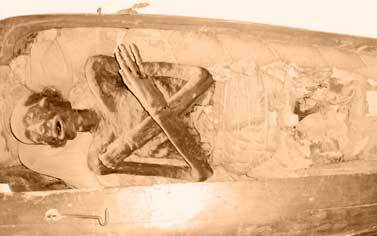 The Supreme Council of Antiquities decided to confiscate a wooden coffin with a mummy inside dated back to 26th or 27th dynasty. The coffin was in a bazaar in town down Alexandria. The decision was taken according to the new antiquities law which states that owners of genuine antiquities in Egypt can register the antiquities and keep it in their possession as long as it is preserved in a good condition otherwise it will taken back by the SCA. In this case the coffin was stored in a bad condition. On the other side, the lady who owns the bazaar is asking for a million dollar compensation as she said she has inherited the coffin beside a collection of 694 objects of ancient Egyptian and roman artefacts.